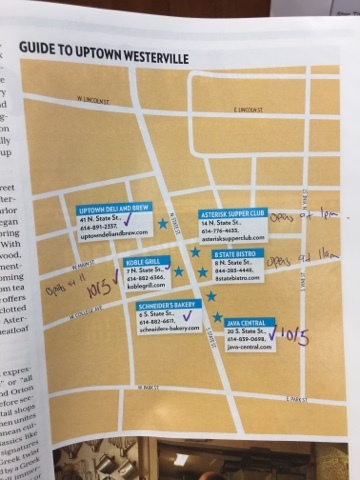 I went to Koble Grill for lunch today because I’m trying to work my way through Columbus Monthly’s Guide to Uptown Westerville. This morning I went to Java Central and got a Nitro coffee and fruit salad. I’d been to Java Central before and I’m glad I tried their Nitro coffee but it’s still not like my favorite coffee shop or anything. I always have mediocre experiences there. At Koble Grill, I ordered a gyro and spanakopita. 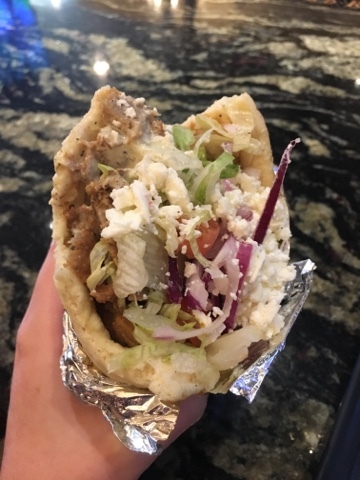 I think I’ve had a gyro from a street vendor before but that’s about it so I was looking forward to giving gyros another try. 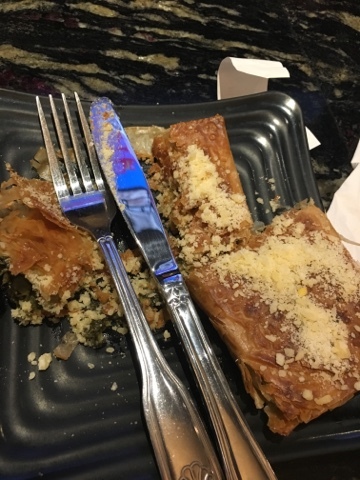 I’d also never has spanakopita either and thought it sounded yummy. I sat at the bar because of what I’d read on Yelp about ordering being awkward. I wish they had a usual set up with servers taking your order at your table. You need to sit down at a table, then order near the back of the restaurant and they’ll bring your food to you. My gyro was messy but delicious. I enjoyed the meat and sauce they used. The spanakopita was also messy but yummy. I made the mistake of taking a bite out of it right when it came out and it was extremely hot. I thought it was a bit unusual that my appetizer and meal came out at the same time, but I’ve read that’s happened to other people too. It’s a beautiful atmosphere inside and a lot of Westerville locals like it. They play loud pop music which I didn’t mind but seemed strange for an Italian/ Greek restaurant.